Snook continues to be the primary target this week. Keeper sized fish will be most prevalent this month as we approach the seasonal closure for the summer spawn. Areas near local inlets will have large concentrations of snook during spring & summer months. Live baits like mullet or pilchards are a sure fire way to catch plenty of snook day or night around structure. Jacks continue to roam open water along with bigger tarpon. Large topwaters or divers is a great way to target either species if live bait is unavailable. Seagrass is starting to show up in areas around the St. Lucie power-plant, this will make for good speckled seatrout fishing with a popping cork & live shrimp. Redfish, snook, jacks, ladyfish, & flounder will be mixed in as well around these shallow grass beds. Fishing nearshore has been spectacular over the past few weeks for migrating cobia. Along local beaches we can find them free swimming on the surface in schools of up to 40 fish on some days. Sight casting these fish with any artificial or fly is an absolute blast. Be sure to bring a gaff along if you plan to harvest one. Jack Crevelles are also daisy-chaining along the local beaches in St. Lucie county. Nearshore wrecks & reefs are holding plenty of cobia, snapper, grouper, sharks, bonita, & kingfish lately. Live or dead bait spread out throughout the water column will ensure a bite from any fish that passes by. This week we will predominantly be focusing on bottom fishing due to opening day of grouper season. depths of 60′ or greater will give you good odds at catching groupers this week when fishing live or dead baits on the bottom. Lager baits will produce larger grouper. a grouper rig typically consists of 60 lb. leader 6-12 ft. in length attached to a swivel with a 6-12 oz. sinker attached to our main line. I suggest using heavier tackle to ensure you can keep larger groupers from swimming back into cover on the bottom. Typically in Stuart you can expect to catch gags, blacks, reds, & scamp groupers at the start of season. 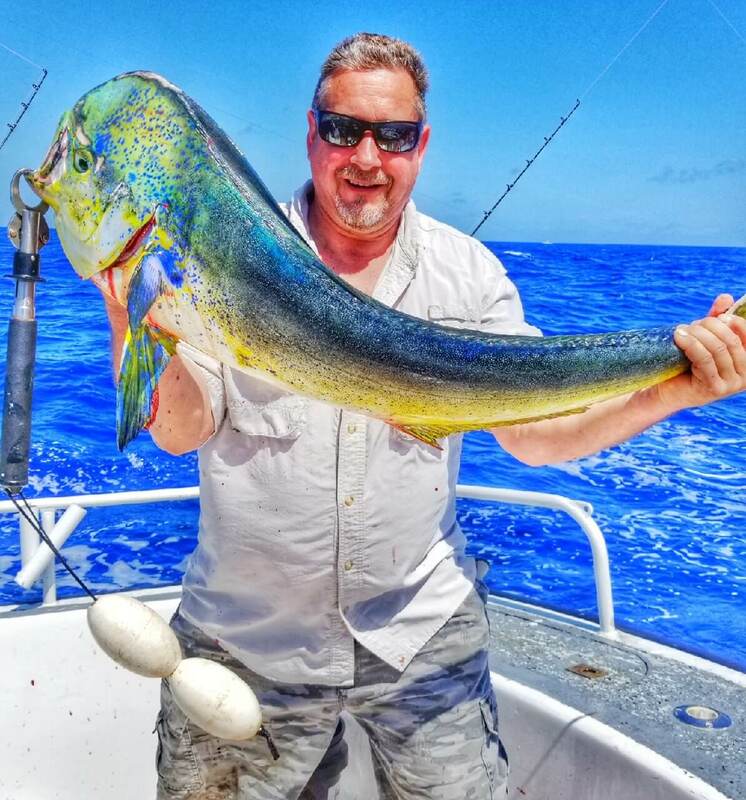 Moving on to trolling- mahi fishing should heat up any day now. depths of 90′ or greater is always a good place to start around any current edges, weedlines, or floating debris. Wahoo can be caught high speed trolling around the full moon in depths of 160′-240′. Yellowfin tuna bite has been hit or miss roughly about 60-80 miles northeast of the St. Lucie Inlet this week. Lots of giant mahi have taken there place but nobody’s complaining yet. It appears most of the mahi have stayed on the other side of the gulfstream locally so far this season.